After a few technical hiccoughs, we are now back into the publishing swing! 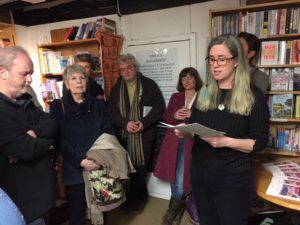 Thank you so much to all those who attended our three launches of the My Europe Anthology in March! Our first launch was at the University of Westminster on Thursday 8th March. 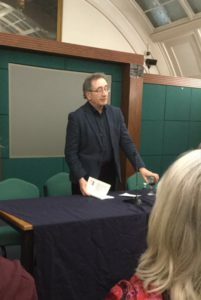 We were delighted that so many people attended and that George Szirtes read his poem: Je Suis Européen. 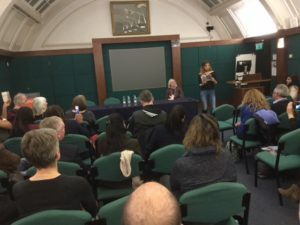 Other readers were Suzy Adderley, Wersha Bharadwa, Giacinto Palmieri and Petra McQueen. 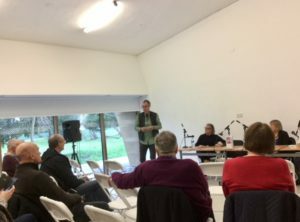 The second was held on Sunday 11th March at the Firstsite gallery in Colchester where we held a very interesting discussion on Brexit and the Arts. Uwe Derksen, one of the panellists, contributed an essay to the anthology. Thank you also to Joanna Jones, Anthony Roberts and Liz Trenow, our other panellists and to chair, our own Mark Brayley. 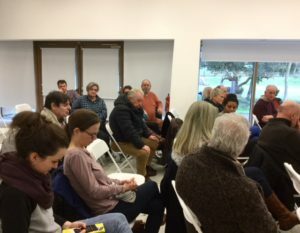 The Wivenhoe event (as part of the Essex Book Festival) was rescheduled to Friday 16th March because of travel disruptions caused by the snow. Because of the snow we had to be pragmatic and postpone our event. Perhaps we should take one more pragmatic step and cancel ‘Brexit’? Many argue it was a democratic decision but Cambridge Analytica influenced voting decisions and Leave.EU illegally overspent on their referendum campaign, for which they have now been fined. Brexit forecasts aren’t exactly encouraging. Will we have the courage to admit the yes/no referendum was too simple and didn’t spell out all the consequences? Vine House no longer distribute Pudding Press titles, but they can be ordered directly from this website. After a visit to Tasmania and a study of the extinct THYLACINE, which features in Darkling Park by Elisa Marcella Webb, an export edition is available via Lightning Source. Sara Elena Rossetti is having a new poem, Dov’eri prima di adesso? Where were you before now? published in The London Magazine. Two new titles are being published in the early autumn. The first is The Life of Almost by Anna Vaught (the paperback cover for which is in the process of being designed) and the second in Italian, is Coma by Arturo Croci. More information to follow.